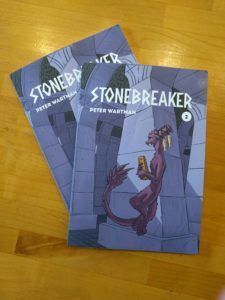 Stonebreaker Part Two can be ordered now! No Comments on Stonebreaker Part Two can be ordered now! I got an exciting package today, sooner then I expected it. Check out what I found inside! So yep, Part Two of Stonebreaker (consisting of chapter 2 and some bonus development sketches) is now up on my store! I’m not sure how many books the final story is going to consist of yet, but there will be a fairly respectable stack before this is all over. Honestly, I’m looking forward to it. We’re getting into parts of the story I’ve been waiting for almost two years to draw now, and things are going to get a lot more dangerous, complicated and generally weird from here on. Great for us readers, maybe less so for my poor characters. Thanks again for reading! I’ll get back to finishing up Part Three.